A big Bikini Bottom salute to jaundiced Jim Salicrup who very kindly provided us with today's horrifying images! 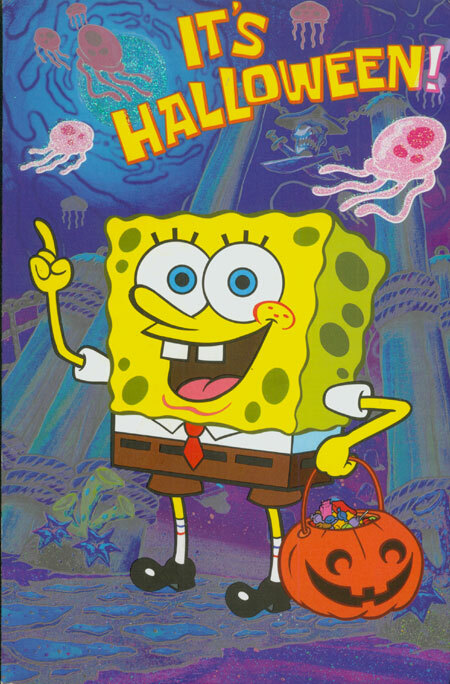 Thanks ever so much for the card, Jim ol' pal, and I'm only sorry that the interior portion was just too big for my scanner, Nevertheless,I think we get the idea anyway--even SpongeBob loves October 31st! 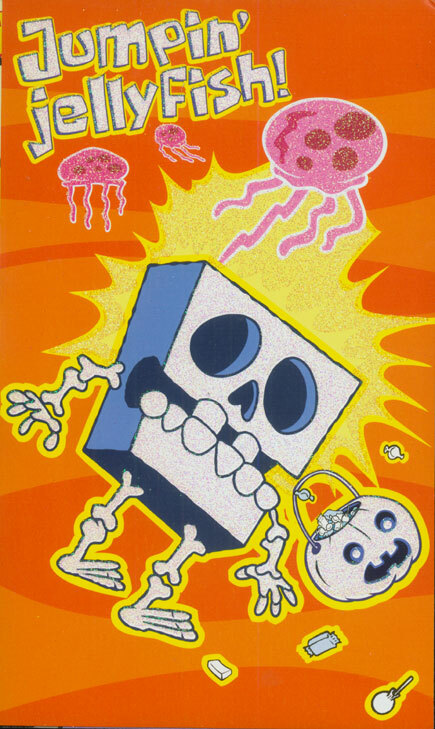 Two years ago, another friend pointed me towards this website, and a two CD compilation of musical oddities available for downloading entitled "Ghouls With Attitude". Well, I burned myself a couple of discs, and popped 'em into the CD player. Now, most people would've listened to 'em once out of sheer curiosity, maybe twice, but not me--uh uh. Much to the consternation of my entire family, I spun 'em nearly as often as a new McCartney recording--and I AIN'T talkin' Jesse, gang! While I did try to limit my obsession seasonally, once October rolls around, these comps inevitably find themselves in hot and heavy rotation, and--sorry Lynn, sorry Julie--it's happened once again in recent weeks. Among my very favorite tunes (such as it is) is a little number called "Monster Surfer" by the Abominable Surfmen. Obviously an early sixties garage band attempting to cash in by combining both the then current surf and monster crazes. The ditty begins with several members of the group repeating the title phrase three times over before the lead singer--affecting a middling Bela Lugosi accent (there is no such thing as a BAD Bela Lugosi accent)--declares "I am the monster surfer", and then mock croons a series of quip filled couplets. My favorite moment comes about a minute into the number, when, after the fourth repetitive chorus of "Monster surfer", the featured vocalist takes his cue and begins, "I am the monst--oop", only to stop suddenly when he realizes it's time for the instrumental break! This was one monster who could've used a little more re-HEARSE-al! Shortly there after, the song just sorta peters out oddly, as the background singers begin to openly laugh as they harmonize the tune's title, only to have the music stop entirely as one of the guys affects a bad imitation of a nerdy girl asking our lead singer--for no particular reason--"Are you married?" And that's it--end of song. Well, it may not be "Yesterday"--heck, it ain't even ":Scrambled Eggs"--but that sure didn't stop it from becoming permanently lodged in my ever soft cerebellum. And so, for the past few weeks, I've been walking around the house, openly (and often) crooning--in my best Lugosi approximation--"I am the monster surfer", almost causing the other members of the Hembeck clan to look forward to the upcoming Christmas record season--almost. I share all this with you so as to preface what happened just hours ago, and in an attempt to explain my reaction to it. Y'see, Lynn and I had just finished watching some TV, so we switched on over to the Weather Channel to see what was in Tuesday's forecast (near 70 degrees, a GREAT day for Trick or Treating), and while we were waiting, the Weather Channel ran a few seasonal filler clips. The last one took place out on the California coast, and spotlighted a group of costumed folks rollicking on the beach and in the waves! There he was! 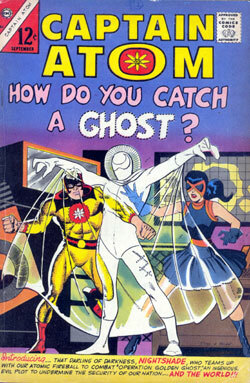 There, clear as day, was a guy wearing a cape and mask, riding a surfboard! I leapt to my feet, pointed at the TV screen, and yelled in giddy delight to Lynn, "There he is! THERE'S the monster surfer!!" Okay,okay--maybe you had to be there, but hey, is it any wonder that I love Halloween so? As noted yesterday, Halloween is peering at us from just over the horizon, and that's the topic of this week's all-new 78th episode of The Fred Hembeck Show! Check it out--if you dare! Let's all lift a glass in honor of The Johnny Bacardi Show! One of the true stalwarts of the internet celebrated his fourth anniversary online several days ago--congrats, fella! Make that a double-double for me! Brief observation: I've never been much of a fan of Yoko Ono, but I can now state this unequivocally: Heather Mills McCartney--WORST BEATLES WIFE EVER! By the time we neared the scene, we could see a woman hastily attempting to climb out of a window. Several other cars had already stopped to offer aid, and as there were no flames, we decided to continue on our way. The wildly improbable accident--did a tire blow?--did spook our driver a bit, though, but she eventually calmed down, and we made it to our destination, right side up. Y'know, you see stuff like that all the time on TV and in the movies, but when it happens right in front of you, in real life, with nary a stunt man nearby, well, it can be pretty jarring. Hopefully, it was only the car that bore the brunt of that rollover, but I guess we'll never know, will we? Just in time for Halloween--AND for 20 cent listing day over on eBay!--I present you with my version of Frank Frazetta's classic cover painting fronting Ballantine Books 1964 collection of EC Comics horror stories! Man, that book made quite the impression on me back then, as it marked my very first exposure to those legendary terror tales! Lemme tell ya, I sure didn't get much sleep THAT night! 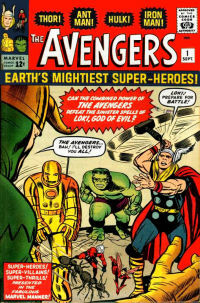 Like I said, it's cheapo listing day at the all-purpose internet auction site, which can mean only one thing--it's time to flood the market with Hembeck cover redos! Yessirree, I just got finished putting 23 pieces up for bid--including the faux Frazetta, natch! 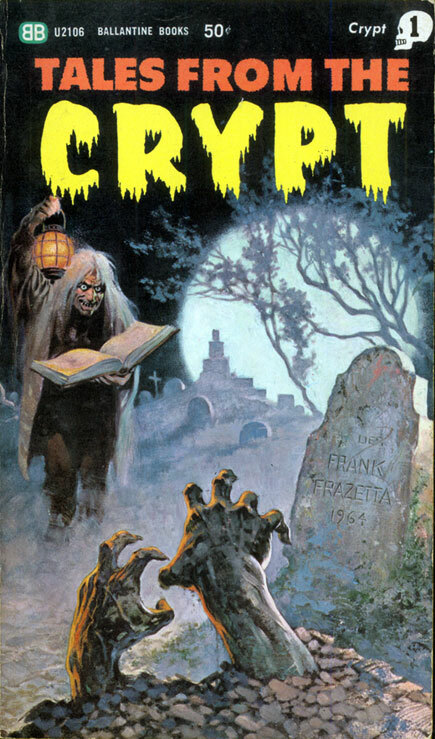 Rather than give you links to ALL of the listings, here's the Tales From the Crypt one--check out "seller's other items" for a peek at the rest if you're interested. And speaking of which, while 12 are retread items, there are fully 11 new, never before seen images available for your perusal. If you'd rather not go anywhere near the eBay site, well friends, you can instead view them hereabouts simply by clicking onto any and all of the images below. Those are the beloved originals--merely run your mouse across them and you'll instantly be taken to the specious Hembeck regurgitations! While school work and social obligations had kept Julie from watching half of the previous six contests. the three she had sat through had one particularly intriguing thing in common--they were all Mets wins! So, aside from short trips away from her seat during commercials, she wasn't moving from her spot while the ball was in play! ...and then Luigi the cat came inside from roaming the great outdoors, and sidled up alongside her. Julie couldn't help but notice a pair of nasty looking ticks on the kitty's ear, and they were bothering her so much that she decided to get up and run to the bathroom for a pair of tweezers. "I'll be right back", she promised. You know what happened next? Uh huh--she couldn't have been gone more than thirty seconds, but that's all it took for Yadier Molina to launch an Aaron Heilman pitch over the right field wall, transforming an evenly knotted 1-1 ninth inning deadlock into a 3-1 Cardinal's advantage. 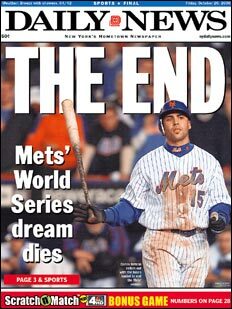 Quite a shame, as it looked for all the world that the tide had turned in the sixth inning, and the Mets were flat out destined to win. 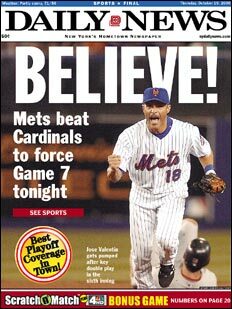 That was when Endy Chavez went up over the wall to reel in Scott Rolen's potential two-run home run, instead turning it into an amazing double play. Has a play that good ever been executed at a such a critical time in post season history? I can't ever recall seeing one quite that special. Hey--you just KNEW the Mets were going to score in the bottom of the sixth after that bit of magic! And it sure seemed like they were going to, especially after Rolen's key throwing error. But even with the bases loaded and only one out, Jose Valentin and Endy Chavez--yes, THAT Endy Chavez--failed to deliver, wasting a magnificent effort by Oliver Perez, the 3-13 hurler pressed into service due to injuries that decimated the top end of the pitching staff. The boys had one more chance in the bottom of the ninth, getting two men into scoring position (the selfsame Valentin and Chavez, who'd failed three innings earlier), and then loaded the bases for Carlos Beltran. A sharply hit single ties the game, an extra base knock in the gap wins it. 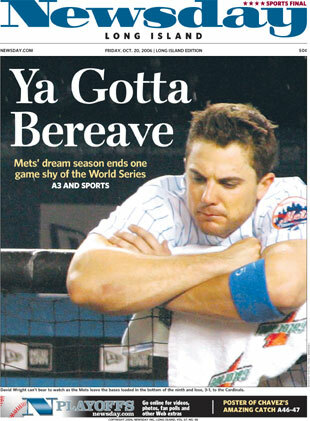 Instead, the Mets 2006 season ends with their best player taking a called third strike. I'm not gonna cry about the results. The team had one heckuva season, and given the shaky make-up of their play-off rotation, went further than most anybody expected them to. Both Oliver Perez and John Maine acquitted themselves magnificently. If anything was to blame for the Mets giving way to St.Louis, it'd have to be the overall tepid hitting from their big batsmen, David Wright n particular. But, in the post season, the pitching just naturally takes it up several notches, so it's not all that surprising, just disappointing. 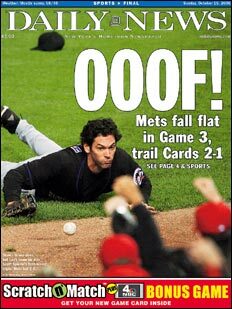 Hold your heads up, Mets--you did your best! I'll be back with ya next year, fear not! The good news is that now I can finally stop obsessing over baseball! 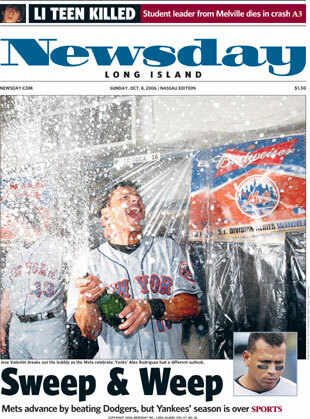 No more of these daily recaps and NY tabloid covers. Yeah, I'll probably watch the World Series--even without Tommy Lasorda around to coax me out from under the sink--but it'll be more from the vantage point of a disinterested observer. I won't be hanging on every pitch, that's for sure. I might well be at the drawing board, or reading something, or surfing the net--and I won't be watching the one hour pregame--and two hour post game--shows offered by the Mets newly-minted SNY TV network, that's for sure! Yeah, it's too bad about the Mets, but it's nice to have my life back (such as it is). 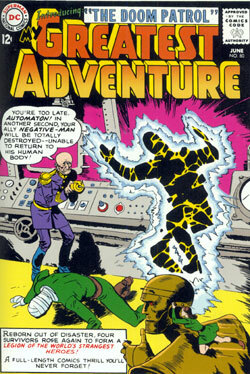 By the time King Comics launched their modest line--consisting of a mere three titles--back in 1966, I was well aware of Flash Gordon, though mostly from second-hand sources. Y'see, while the Long Island Press--one of three dailies my dad bought every day--featured the adventures of King Features two other newly minted funnybook stars, Mandrake the Magician and the Phantom, growing up, none of the local papers carried the escapades of Mongo's number one adopted son. 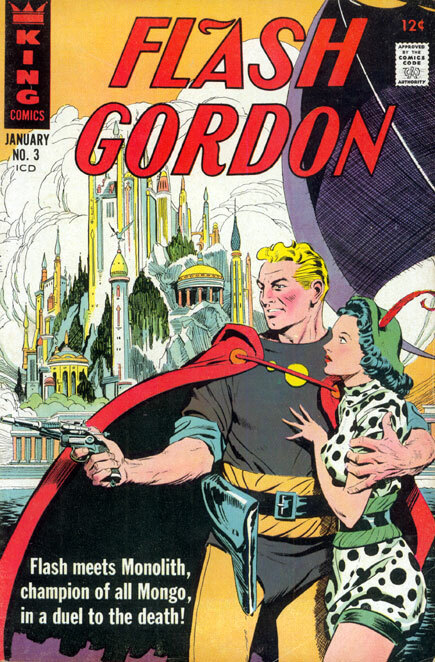 So let me tell ya, that first issue of FLASH GORDON came as a bit of a mind-blowing surprise! Working at the very tippy-top of his game, artist Al Williamson turned in a magnificent homage to Flash's creator, the late Alex Raymond, producing a comic book that has to rank as one of the single most exquisitely illustrated issues to hit the comics racks during the entirety of the sixties! Absolutely gorgeous stuff! For what ever reason--too much pink maybe, or perhaps the mid-to-long shot didn't spotlight our hero to maximum effect, or maybe it was just that Flash's outfit clashed with the aliens he was clashing with, take your pick--the cover never came anywhere close to matching the beauty contained within, at least to my then 13 year old eyes. (Form your own opinion by going here). When the third issue rolled off the presses, though, well, THAT cover certainly would've made Flash's newsstand debut absolutely perfect had it been used instead ! (As it was, Al Williamson's beautiful tableau fronted an entirely Ric Estrada illoed ish, quite the disappointment at the time, though I've come around to appreciating Mr. E's work more and more over the years. Still...). Which is my long-winded way of getting around to telling you that I thought maybe I'd have me a go at it, so here's the link to MY redo of FLASH GORDON #3. And yes, here's the link to my eBay auction of same--c'mon, by now, you didn't expect any less, did you?! And while we're doling out links like they're sausages, here's one for the just posted 77th Episode of The Fred Hembeck Show. (Hope you've all enjoyed this brief respite from baseball. Now excuse me--game seven awaits!...). After all, the Mets were facing elimination with a 25 year old mid-season call-up on the mound, a pitcher who, had Pedro not gone down a week before the post-season began, might very well have been left off the playoff roster entirely. His opponent? Last year's--and very likely this year's as well--Cy Young award winner. So you'll excuse me if I mentally prepared myself for last night's contest being, in all likelihood, New York's final game of the season. 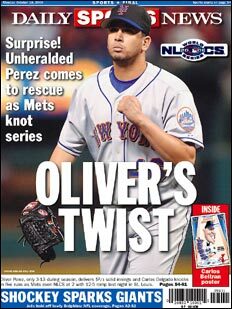 So tonight, for ALL the marbles, it's Oliver Perez again. 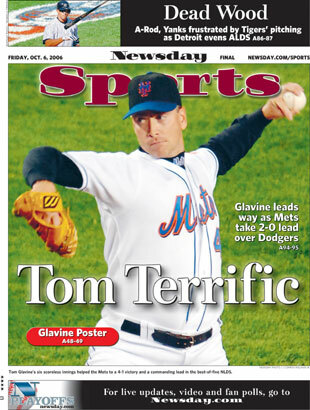 He wasn't even on the roster for the Division Series, and in fact came to the Mets mid-season as a throw-in when the team made an emergency trade for a reliever after their top-set-up guy was injured in a freakish cab accident! But when El Duque joined Pedro on the sidelines--and Steve Trachsel pitched himself out of consideration in a woefully bad game three--all of a sudden, Perez get's to pitch the game of his life! He opened the season taking the mound for the lowly Pirates--who subsequently demoted him to the minors, please note--and NOW look at where he is! That's one of the great things about baseball--you just never know what's gonna happen! Maybe I'm being foolish, but yeah, I'll admit it--I BELIEVE! So, um, I guess all that talk about the extra day of rest provided by Monday's rainout helping the Mets was--you guessed it--all wet, huh? And speaking of the zone, the boys in blue and orange had better be in it later tonight when the series moves to Shea, or it's all over. Backs up against the wall, fellas--I've got my fingers crossed. HEAR YE, HEAR YE!! BANG A GONG!! 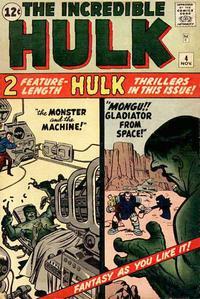 ...TODAY IS JOE SINNOTT'S 80th BIRTHDAY!! For those of you who've never had the pleasure of personally meeting the Marvel Comics legend, let me assure that he's as nice a fellow as he is a talented one, if not more so--and THAT, friends, is mighty nice, cuz we all KNOW how talented he is!! With great admiration and respect, allow me to tip my cap to you, Joe, and wish you and yours nothing but good things in the future! 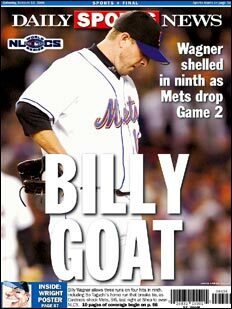 First it was Billy Goat. 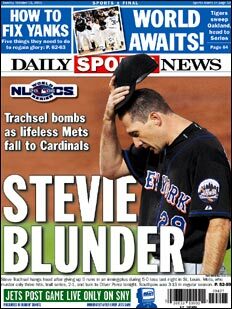 Then it was Stevie Blunder. 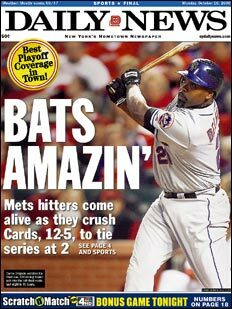 Ahh, you just gotta love the genius who writes the headlines for the New York Daily News--this year's NLCS has certainly given them plenty of fodder for pun fun. And what about Oliver's twist anyway? Yesterday, while reading the tabloids (online, natch), the general consensus seemed to be, the sky's falling, the sky's falling!! After all, panic appeared to be a natural reaction--Perez (acquired mid-season from the woeful Pirates and them assigned to the minors before a late season call-up) not only had a 3-13 record, but also possessed the highest ERA of any pitcher ever to start a post season contest! (Another dubious mark--the combined winning percentage of Perez and his opponent, Card's rookie Anthony Reyes, was the lowest ever seen in such circumstances). But you know what? Three years ago, as a rookie, Perez went 12-10 for a bad Pittsburgh team and notched over 200 strikeouts. Now, things may have gone way south for Perez in the years since then, true, but he's still young (25) and he's shown, at times, more than a glimmer of his early glories during several of his September starts for the Mets. Me? Well, I had a feeling he was going to come through last night, and much to my--and every other Mets fan's relief--I was right. Of course, getting 12 runs helps, too. Still, he held it to a 5-3 lead through five before his teammates plied on big-time in the sixth. Known for his wildness, he walked only one, and when tiny David Eckstein led off the fifth with a homer to cut the Mets freshly minted lead (notched on a three run blast from Carlos Delgado in the top of the inning) to cut the deficit to two, he didn't rattle, Instead, he proceeded to strike out both super-clutch Scott Speizio and super-threat Albert Pujols, then getting the third out of the inning on a harmless flyout. And then the bats exploded, and the game was essentially over. Series even, two apiece. Rain expected tonight, and if things get pushed back a day, thus giving Tom Glavine an extra day's rest, hey, you won't hear ME complaining! Well, whatever happens, I'm sure whoever pens the blurbs for the Daily News will have a suitably appropriate groaner to describe things! And I'll be SO envious! Brrr--last night's game was a tough one to watch. The truth is, it was over by the time the Cardinals made their first out during their second turn of bat. 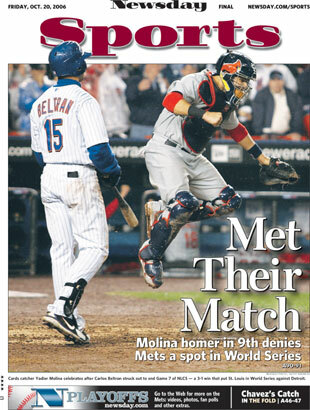 By then it was 5-0, and it was still 5-0 when the last Met batter flied out to end the ninth. And who knows--the way starter Steve Trachsel was pitching, had he remained on the mound much longer than he did, the final score might've wound up 27-0! So Taguchi, an outfielder who came in primarily or defense in the bottom of the eighth, led off the top of the ninth against the Mets big money closer Billy Wagner with the score, 6-6, blasted a tie-breaking home-run! This was the Japanese imports second post season at bat, and his second long ball--this from a guy who hit all of two homers in 316 at bats during the regular season!?! 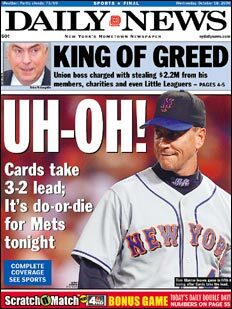 And then Wagner gave up two more runs, dooming the New Yorkers to a 9-6 loss after nearly four hours of having the Cardinals right on their tail, finally surpassing the Mets for the first--and only--time all night. The only time it counted. Bad timing. 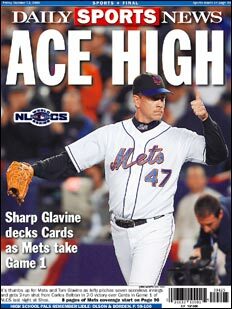 Not much to say about the game last night--Tom Glavine pitched seven shutout innings, looking like the ace he is, and Carlos Beltran's two run bomb couldn't have come at a better time as the Mets triumphed over the St. Louis Cardinals 2-0 in last night's opening game of the National League Championship Series. Here's your link to this week's 76th episode of The Fred Hembeck Show. It's short, it's sweet, and if features two brand new Hembeck illos, one each of a certain Amazon Princess and of a decidedly Dynamic Duo! Take a gander, group! 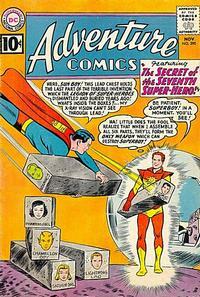 Honest to gosh, if you have ANY interest in the Silver Age of Comics, you owe it to yourself to check out Robby's exemplary investigation into the career of one of the greatest unsung talents the comics field has ever seen! But since i know some of you are a tad bit lazy (no names, please), I'm gonna do us all a favor and provide links to all ten scintillating chapters below! GO! Elsewhere in the cake and candles department, I'd like to send a shout out to my pal Todd Dezago! He may not've designed any world famous logos--hey, how many of us have?--but he's written some mighty fine funny books in his time! You can check out Todd's MySpace page and his Perhapanauts Blog to learn more about the birthday boy! Have a wonderful day, friend! ...especially of you're way, WAY tired of suffering through over a full decade of arrogant Yankee entitlement. The baseball gods certainly have an amusing sense of timing. There they were, The Greatest Lineup In The History of Baseball, getting pummeled once again by the Detroit Tigers, a team that limped into the post season, losing a series on the last weekend of regular play, giving up their hold on first place for the only time all season, ceding that honor to the Minnesota Twins, instead squeaking in as the wild card winner. Because of that, they also lost home filed advantage, and had to begin the Division Series against the team with the best record in the AL, the mighty, mighty Yankees. And just like everyone expected, they lost the first contest, and were behind in the second one, too. But then something funny happened that afternoon in Yankee Stadium--the Bombers suddenly forgot how to hit, going some 20 plus innings between plating runs. So when the Yankees went into the ninth trailing 8-1 (a too little too late two run homer from Jorge Posada inflated the final score to 8-3) less than a hour before the Mets were scheduled to take the field in LA against the Dodgers, it made for riveting television for gleeful Mets fans from coast to coast (but mostly ones here in the Empire State). Now all we needed for a perfect evening was a Mets victory over the NL wild card winner, who, unlike their American League counterparts, completed their schedule reeling off seven straight victories (the Mets won their last four themselves, but that was after having a very shaky month of September). Cynics might well say that this other New York team had nearly as inflated a payroll as the proliferate spending Yankees, and that might be true, but hats off the front office for knowing how best to spend that money. This team has a certain chemistry, a chemistry that looks (to this admittedly biased observer) to be lacking from that other line-up, the one that--no exaggeration here--boasted an All Star in every hole, one through nine. Of course, with baseball you just never know. The Mets could suddenly go cold, and get whomped by the Cards in four straight games, but somehow, I don't think that's likely to happen. Hey, any team that can sweep their opponents after having their opening game pitcher scratched not once but twice has got to have some good karma hovering over them, dig? Next game: Wednesday night! Superfluous commentary here: next Thursday--bye! 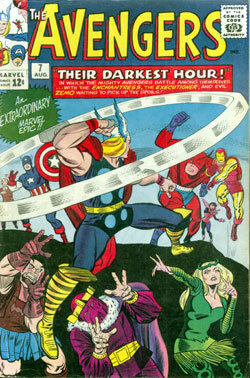 Ditko creation that was eventually ko-opted by Kirby! 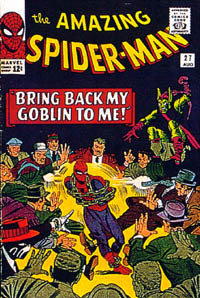 Sturdy Steve set Spidey up to face the grainy goon in the Amazing One's fourth issue, but after making several other memorable appearances--including being numbered as one of The Sinister Six--Stan Lee drafted him for ongoing membership in The Frightful Four, the evil FF. Initially, the big guy merely swapped his green-striped sweatshirt for a purple one (his new found associate's colors, don'tcha know), but before long, he found himself royally decked out in a typical snazzy sci-fi suit of armor courtesy of King Jack! 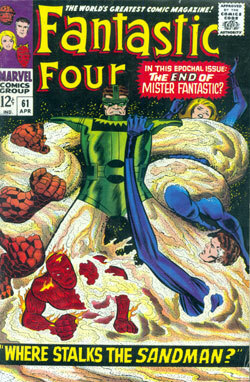 And that's what that nasty son of a beach wore for the cover shoot of 1967's FANTASTIC FOUR #61. 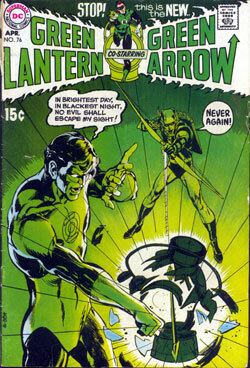 Here's my very own cover reinterpretation, and (uh huh) here's the link to the current eBay auction of same. 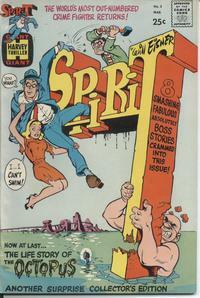 A terrific cover that was terrific fun to redo. 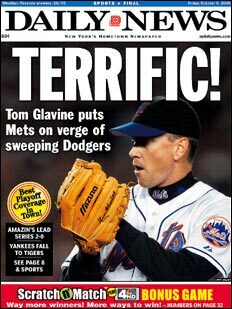 Terrific Tom Glavine led the Mets to a 4-1 win over the Dodgers last night , putting the Mets up 2-0 in a best 3 out of 5 series. Sweet. Hopefully they can wrap things up in LA tomorrow night--though going up against Hall-of-Famer-in-waiting Greg Maddux won't be a cakewalk. Curiously, against 290 game winner Glavine, the Dodgers sent out a rookie pitcher from China with one career win in game number two! ONE! 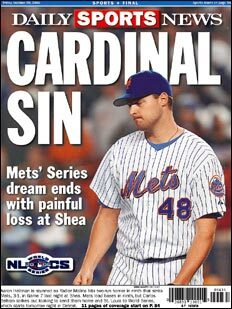 Of course, that one game was a shutout about a month ago, in Shea against these very same Mets, but the gamble didn't quite pay off. The Mets had to struggle for the two runs they did get off the lefty, true, but somehow, someway, they looked determined to get the job done, and they did!. 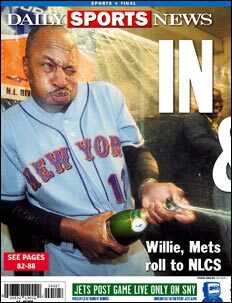 By the way, there are four managers in the playoffs this fall who once played for the Mets: the Twins Ron Gardenhire, the Padres Bruce Bochey, the Yankees Joe Torre (who also began his managerial career by helming the (then-not-so) Amazin's), and the Mets own Willie Randolph, who ended his playing career in Queens, across town from his long-time pinstriped employers. The Twins are gone, the Padres are down 2-0, and the Yankees are 1-1 (though down 6-0 to the Tigers in the eighth inning of game three as sit here, so oh uh--no Subway Series this year, I'm thinking ). Willie--you might well wind up being on your own from this quirky little quartet! 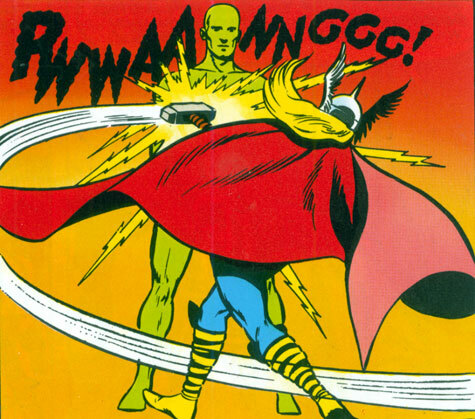 This time around, The Fred Hembeck Show Episode 75 throws some light on the heretofore little known connection between the nuptials of a long-time Marvel icon and the career of a former Mets superstar. It's all new, too! 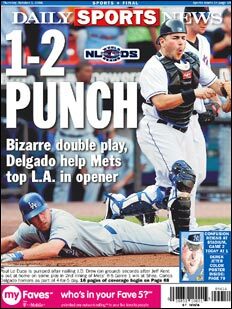 And speaking of the Mets, how about that opening playoff game against the Dodgers yesterday? Wow! It's a safe bet that even the neighbors several houses away heard me scream in stunned delight as not one but two Dodgers ran into outs at the plate, both during the self same play in the second inning, keeping the contest scoreless to that point! And how about that John Maine? First Pedro goes down, then his replacement, El Duque, hurts his leg preparing for his start on Tuesday, Steve Trachsel had just returned from personal matters out on the West Coast and wasn't sufficiently ready, and though Tom Glavine volunteered to take the mound, manager Willie Randolph wisely said thanks but no thanks, knowing he'd be more effective on his normal rest pitching game two. So, the 25 year old rookie, the fifth man in the rotation, the mid-season call-up, suddenly found himself taking the mound for the New Yorkers' first post season game in six years! And he did just fine--one run in four and a third innings. 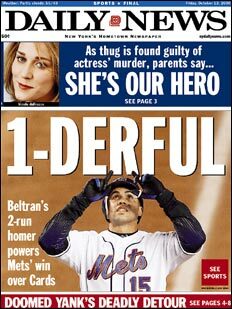 True, he left a pair on when he exited, but the Mets exemplary bullpen bailed him out, and the Mets bats--first timer Carlos Delgado went four for five with a big home run--did the rest, with the Mets finally winning a nail-biter, 6-5. Quiet a thriller! Game two tonight! More later! For Major League Baseball, the regular season came to an end yesterday, and by winning their last four in a row (including a sweep of Hall of Famer Frank Robinson's Washington Nationals in his final games as a MLB skipper--sorry Frank), the Mets not only managed to post a .500 record for the month of September, guaranteeing that the record books would show not a single losing months for the Metsie's '06 campaign, but that they'd also tie for the very best record in all of the Majors with a final tally of 97 wins, 65 losses. The OTHER team with that record (the one who, as it turned out, lost yesterday)? 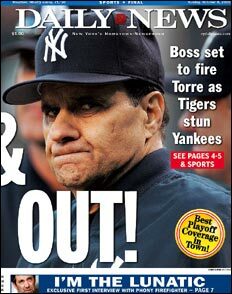 Wouldn't ya know it--the New York Yankees. Both teams had identical records on the road (47-34 ) AND at home (50-31)! 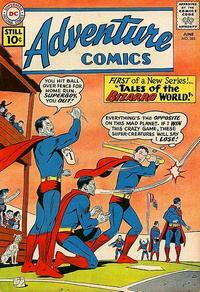 "It's like Superboy vs. Bizarro" exclaimed Tom! Me hope Yankees beat Mets real bad!